Tradition Field, Port St. Lucie, Nov. 16, 2013—In a rematch of last year’s 25-and-over championship game, the Puerto Rico Lobos again defeated Cleveland Steve’s Sports at the spring training home of the New York Mets — this time by a score of 4-0. The Lobo’s vanquished the hard-luck Clevelanders 5-4 in last year’s title game. This year, Gilberto Ramos tossed a complete game shutout and Rene Quintana finished 3-for-3 with two RBIs. It was the Lobos’ sixth trip to the finals in the past eight years. The Lobos defeated Cleveland Steve’s Sports 5-4 in the 2012 Fall Classic title game. Ramos limited Cleveland Steve’s Sports to just five hits while striking out six and walking one. 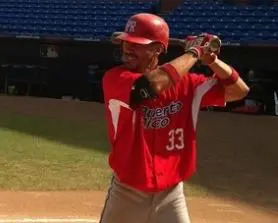 Ramos also pitched a complete game in a victory against Cleveland Steve’s Sports in the 2012 finals. Chris Amadorwent 2-for-4 with two stolen bases and two runs scored. Jetzel Torres had two hits and an RBI triple and scored a run. The Lobos never trailed and jumped out to an early lead. Amador had a leadoff single in the first inning and took advantage on the base paths with his speed. After stealing second and third, Amador scored on an RBI groundout by Cristian Quintana. The Lobos had a two-run seventh inning to extend the lead. Amador had a leadoff single to left. Torres then drilled a pitch down the left field line past the diving reach of Brendan Krowka to plate Amador for an RBI triple to make it 2-0. “It was a big hit and it felt really good to help the team win a championship,” Torres said. Rene Quintana ripped a base hit to score Torres to extend the lead to 3-0. Cleveland Steve’s Sports threatened during the game with multiple opportunities offensively, but Ramos was able to make quality pitches when he needed to the most. Ramos retired Zac Johnson on a fly out to left to end a threat with runners at first and second in the first inning. Ramos retired 11 straight batters before surrendering a one-out single to Johnson in the fifth inning. After Jon Bazan’s two out double put runners at second and third, Ramos induced a fly out to center off the bat of Steve Ross to escape the jam. Steve’s Sports had runners at first and second with no outs in the seventh, but Ramos responded to thwart another rally. Ramos struck out Jeff Tillman and Vinny DiMarco grounded into a 4-6-3 inning ending double play. Ramos retired the side in order the ninth as Krowka flied out to left fielder Rene Quintana to end the game. Torres praised the effort of Ramos and he what he meant to the success of the team. The Lobos defeated Steve’s Sports in both meetings during the tournament. Jeff Salaysuffered the loss despite tossing 8 2/3 innings while allowing four runs and eight hits. He struck out six and walked two. Jon Sprowlsallowed an inherited runner to score in the ninth inning on a Rene Quintana RBI single with two outs. Sprowls allowed one hit and struck out one in relief, recording the final out of the ninth. It was the second finals appearance for Cleveland Steve’s in their 18-year history.